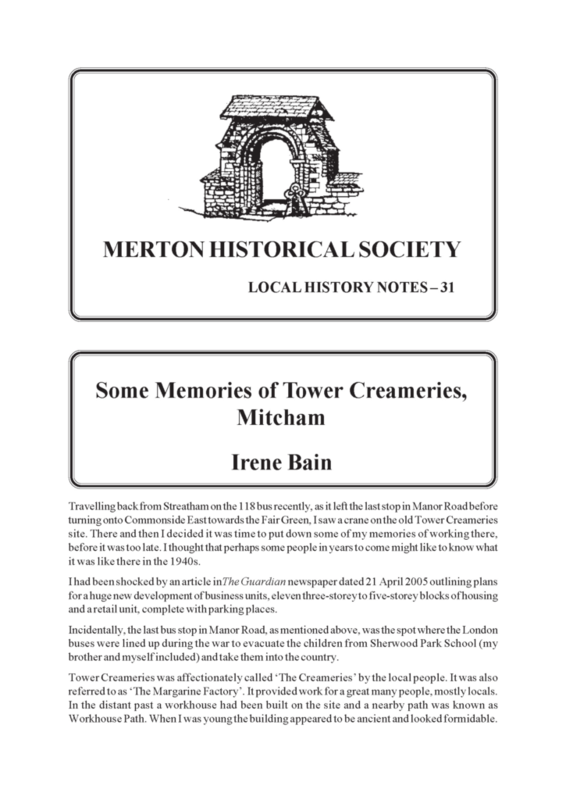 Stirred by the sight of a massive redevelopment on the site of the Tower Creameries, Irene has recorded her memories of working there in the 1940s. After a short spell with C&A Modes in Oxford Street, she began at the Creameries as a messenger girl in 1944. Her duties took her into almost every department and office, and her memoir takes us by the hand and gives us a guided tour of the entire premises. This is far from a mere list of rooms, as it is illuminated by deft sketches of the people who worked in them. This includes all three directors, who were obviously kind men. Irene moved on to the Accounts Department and then the Typists Room, and gives us a real feel for working in them, with some lively anecdotes. Her affection for the Creameries shows through: ‘It was a lovely place to work’, she says. And this is a lovely read. and a retail unit, complete with parking places. brother and myself included) and take them into the country. referred to as ‘The Margarine Factory’. It provided work for a great many people, mostly locals. Workhouse Path. When I was young the building appeared to be ancient and looked formidable. There was a sturdy, grey tower on one corner, which gave it something of the look of an old castle. flat and empty, ready for whatever is going to be built. It was a trip back to the past for us. girders carelessly flung over the surrounding common. was to be paid 27/6d per week. following day, and Lt A F White (aged 38) survived until 19 April. ** The plaque is now in the Royal British Legion building, 21 St Mark’s Road, Mitcham. in a bright, modern very high-ceilinged entrance hall. To Mr Pearce’s right, a flight of winding stairs takes us up to the main offices. All is smart and new. See, the floors are of polished parquet. A corridor leads away to the right, but we will go this way on the left. The first room on the left is the Boardroom. All the Directors are extremely pleasant to their staff and I can’t stress this enough. interviews and hires staff and it was she who interviewed me and gave me my job as a Messenger. there. To the left you will find the toilets. They are very modern and clean. it to our desks. She is a small, slightly plump, old lady and wears an obvious wig and rouges her cheeks. Her dear old head shakes a little as she walks. She’s a widow and we are all fond of her. the catering trade, and they can be bought quite cheaply. down a lot with very hot water. It is hazardous to go through here but I still do. it is a pleasant smell. I do not fraternise. Across from the filing room (again on the left-hand side of the corridor) is the Messengers’ Room. the works and run errands. Supervising us is a lady who will soon be married and leave. The Messengers’ Room is small. On the left two desks have been put together facing each other. of the alphabet in it. If you use the correct fingers for each letter it makes you an accurate typist. so fast?’ he asked. He smiled broadly when I told him what I was doing. coatstand. More of that later! in here at the moment, but as you see there is still room for at least two or three more desks. our surnames. We have a lot to talk about and often go to the pictures together. Now we come to where stairs go downwards and outside into the yard and the loading bays. the young men loading it. excellent English. His assistant is Miss Coe and she can hardly walk because she is so overweight. always addresses me in a friendly, kindly manner and I like her very much. on his calendar. I am young enough to be embarrassed by these. all kept in touch through the Sports Club as they were quite near and used to come over a lot. chef working in part of the laboratory building and are served with tea to demonstrate the products. took his black fountain pen out of his breast pocket and presented it to me as a gift. A lovely gesture! back, at the many kindnesses shown to me. work in here. By the sound of the typewriters, I think they are very busy, so we won’t disturb them. door but a little way further down. Club Nights (which are held twice a week) and for dances. stored away the room is big enough for a Dance to be held here. own rather special bat, as several people had already bought their own. and again, a resounding cry of ‘shot’ when someone hits a winner. well back from the table. to boost the firm’s image. I do not mean advertising hype as it is today. around the dark empty buildings at night checking to see that all is well. shiny black one in there! to the right and can be home in ten minutes! Barns Avenue. Later on my brother and sister worked there too. Winnie and I were both very young, and young people will play. One day we were in a silly mood. closely followed by Mr Bubeloz! To my discomfort they began a long conversation. The Supervisor left to get married and Winnie and I were left to carry on to the best of our abilities. handsome and completely different in looks, as John seemed to have had an accident at some time. had imitation cloth clogs. I got several orders for them and also for the upside-down dolls she made. It all helped the family budget and they were very good value for money. was measured in ounces and sweet coupons were precious. couple of minutes before I left. The office was not empty. had happened to them! I was very upset and left the office as if I was going to the Post Office. Instead I rushed home, arriving in tears because someone would think I had stolen them. I went to the shop and bought the required items and then to the Post Office for the stamps. The tears dried up but I am afraid the suspicions remained as to who had taken the coupons. have heard about it because he offered me a clerical job in the Accounts Department. not marred by nastiness of any kind, as it sometimes is today. outings were as dignified as she was. raining. She left it on a bus and showed no remorse whatsoever. an end, he had promised to buy his son a violin when it was over! the door flew open and Mr Delaragez’s huge form strode in and up to his desk, looming over him. time, so he sent me down there to buy some for the Sports Club. all. We understood she was paid quite a lot of money too. One morning news went around the office that Miss Coe had died suddenly. That was very sad. for me. If there is a heaven then Taffy will be waiting for me. lessons as well, which my mother gave me a half-a-crown to pay for. I can hardly describe the fun we four had – we just gelled together and it was a very happy time. and holidays, each one adding something humorous. came into the office one day she said she hoped they would not put me off my work. went to the wedding, which was held at St Olave’s Church. forced her to take a bath in front of them. To a man they all turned their backs and would not watch. In the end, he told me, she committed suicide as the Japanese kept going into her cell. After that I often used to catch sight of him at a distance walking around the Fair Green in Mitcham. happened to him and how he had spent the War. very welcome in those times. remembered him in this writing. to ice and take around the next day and some of my tears fell into the sponge mixture. ‘The Creameries’ site from ‘Workhouse Path’, c.1966. The old Workhouse Master’s Lodge is centre foreground. and deliver the post etc. The Garage was the next stop – they looked after the large tanker lorries here. also play billiards in the Sports Room. to the biscuit packing room. The biscuits were packed into large square tins. to me that it was dangerous to do this. I had to leave my job as my parents moved to the coast. down, everyone seemed happy at their work. No other job has lived up to this one. the Directors’ names. His last words to me were:’ It was a lovely place to work.’ And it was! This entry was posted in Publications, Local History Notes and tagged in industry, lhn, mitcham, modern mitcham, Reminiscences.